Having just had my Pillar of Creation experience, I was still open and unfiltered. I knew I could call in any being of Light and I would also be able to feel them with the senses that I had been given in my human form – for somehow they had expanded and were not limited to physical location. I entered the intimate sacred space in my friend's apartment and looked toward the alter that had a set of Holy Zohars, the picture of master Kabbalists, candles that were burned from Friday night and an array of beautiful sacred pieces that my closest friend and star sister, Saranah, and I had placed on the alter for Shabbat. In awe of Life, I began to dance in exhilaration and became lost in time and the song that was playing became internal. As I swirled out of a dance move I suddenly felt like I had a tail and a desire to sniff the altar and the photos. In my mind’s eye I saw myself as a provocative white Lion jumping through trees. 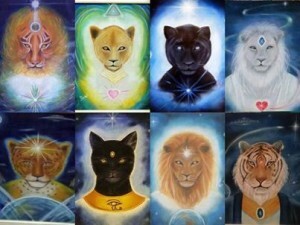 I found myself as a Feline Being from Sirius. I was standing in front of the alter, as the Lion. 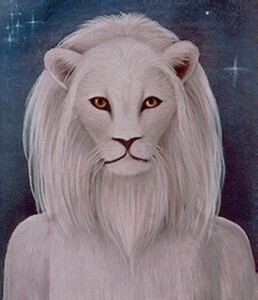 I was a white upright feline Lioness with a jeweled crown and robes of grace. I felt freedom of form, elegant, innocent and vastly curious of everything around me. I was then visited by a Feline companion from Sirius who invited me to come and sit in the garden with others from Sirius to introduce ourselves to one another. I wanted to dance and play and move my nose up and down as I sniffed out my surroundings. I left my ego identity and became a Sirian Princess with her companions, and I took a stroll one more time to the back garden turned Sirian planet. I sat in a chair and three other felines followed to take up the once empty seats in the back garden. In my mind’s eye with my human senses following, I saw and felt myself sitting on a great rock by a running magical river. The air was a bluish translucent color and the other three feline beings were dressed as I, in their own majesty, on rocks in a circle, just like we were in the back garden. The beauty I felt is indescribable and the tenderness that I was met with as I was introduced to the feline companions. They each kissed my white hand and recognized my essence as one of their own. We spoke of their forms incarnate on earth at the time. One of them was an old boyfriend that I guessed was a Sirian some time ago. I saw his perfected self and knew his greatness and was in awe with this vision. I saw that all would be of the greatest good in his Earthly life. I could not understand why I was treated with such importance. Of course maybe this is how the felines treat everyone who visits, or perhaps I was being honored by my willingness to believe and to make the most of the opportunity I was given as a guest Feline. I still don’t know. But this I do know of Sirians; they are compassionate artists that enjoy their dualistic nature playing through the jungles and forests as a Cat, as well as the delicate elegance of an upright creature of Light and goodness. The felines love the sound and smell of water. They have the innate ability to open the telepathic channels of those around them so that they can imagine and dream the greatest worlds into reality. There is a sexual energy that stirs their senses without confusion, as if they use it to sense the energies of creation and fondle these senses to work for the greater good of all. The felines make up stories that fit their path, and travel on that path through cosmic space as an act of leisure and plenitude. They are governed by their curiosity of life and find the greatest pleasure in sharing their findings with one another. Don’t mistake them for anything else than what they are, as the Lion Pride is evident and true. It is powerful and goes without need for introduction yet through their roar is a cub who loves to be affectionate and free to explore the universe expressed through whatever art they choose to bring forth. 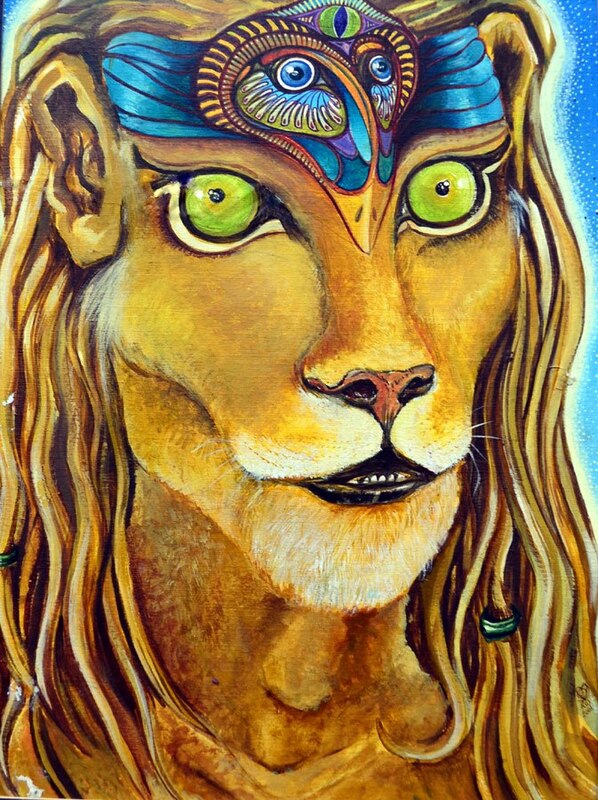 I come to you from Sirius to inform you that we are all entertained by your introduction of our great feline race and to add to your clairvoyance we stand together and fight for the right to enjoy life to its fullest without trepidation or scorn. We use our feline wit to examine the fortitude of situations and embark on journeys that will bring pleasure without pain, and address the insignificant as creative endearment of tone and color and musical love expressed on the canvas of life itself. We are the Sirians and we are One with all life and life forms through the galaxies and universes that gleam in sight. Ponder our nature and you may sense that we love the ways that bring pleasure and Light to all life. 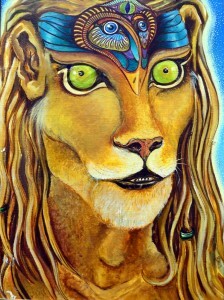 I am Samballa, 7th dimensional Feline being from Sirius. Call on me and I will give rise to our kind on earth, for I am enlightened to shine the form that you spoke of above, as you were cradled to know of our existence that exists within each and every soul. Your activation was clear to us, as you allowed yourself the pleasure of life without judgment. We were allowed to enter and match this frequency with our own. Hence, you experienced life on our planet as we evolved into infinite light. Thank you Ketusa for all your efforts to bring together our kind to a place of acceptance and love from the perspective of our counterparts on earth. We are with you every step of the way. Meow! ~ Samballa of Sirius, incarnate on earth as your friend, Cheila. Purrrrrrrr, sniff sniff, jump, smile, meow!